J.C. Penney released a preview today of their Black Friday deals – prices will be good online Thanksgiving day and Black Friday! Here’s a small sneak preview to help you plan your attack! Click here to view all of the Black Friday deals in every department! 40 Pc Dinnerware Set Only $26 Shipped! 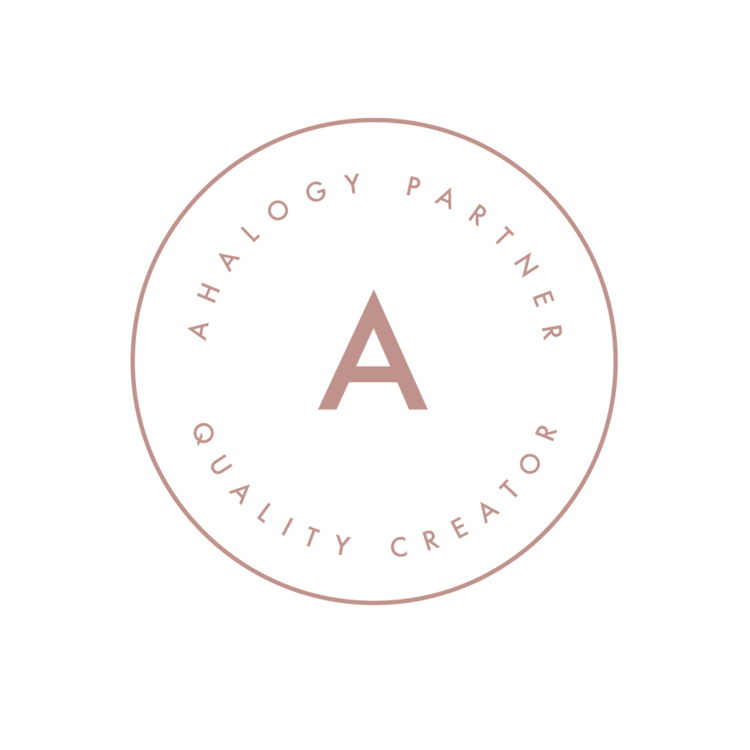 I’ve been on a mission for about six months to find a nice but cheap dinnerware set since the kids have “helped” us to assemble our current mix and match set and I’m not willing to pay too much since the odds are good that they’ll break a few more plates and bowls sooner or later. 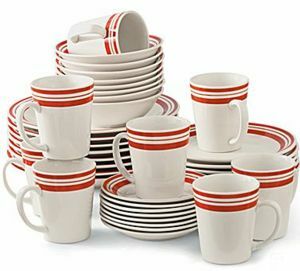 I’m thrilled to have just bought this 40 piece diner style dinnerware set from J.C. Penney for only $19.99! That’s just 50 cents per piece, even less than the cheap melamine stuff I’ve been buying to tide us over that you’re not supposed to put in the microwave. I’m picking my set up at the store, but with shipping at just $5.95 you can have it shipped straight to you for only $25.94. The set is regularly priced at $99.99 and is on sale for $29.99, but the price drops to $19.99 when you use coupon code 2ENDYEAR. Choose from red, blue, green or black. JC Penny is one of my favorite department stores because they always have great sales, quality merchandise and they often put out excellent coupon codes, plus you can get bonuses, discounts and earn gift certificates if you use their credit card . Now through September 24th you can get $10 off a $10 or more purchase with promo code GO4TEN and you can still get free shipping on all shoes. There are lots of different styles on sale right now for everyone in the family, with prices starting as low as $12.99 so you could get a pair for as little as $3 shipped! I love to stock up in the next size up for the kids whenever I run across these sales, so I bought this pair of Arizona tennis shoes regulary priced at $24.99, on sale for $19.99, for only $10.74 with tax after promo code. Hurry over for best selection! Four Pair of Shoes from JCPenney for $3 Each! 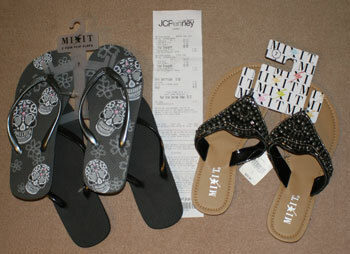 Check it out guys – I got four pair of shoes from JCPenney yesterday for a total of $12.06 or $3 EACH! I had a $10 off $10 purchase coupon that came in the mail so I swung by the store and found all the sandals on sale for between 50 and 80% off. I picked out the pair on the right in the picture below that were priced at $8.99 and then looked for something for $1.01+ so I could use my coupon, and then I found a whole wall of flip flop two-packs that were all priced at $4.99. After tax and coupon the total was $4.07, then for some reason I was compelled to also check out their website once I got home because they’re having a deal where all shoes are shipped for free. 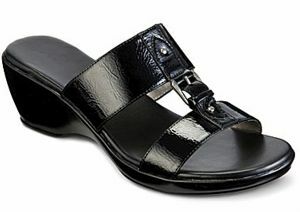 I found the black sandals shown above on sale for $17.99 so I used the promo code TEN2YOU to get $10 off, and with the free shipping I paid $7.99 for them. 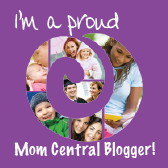 Yes mom – I’m done! You can save from 15 to 30% off at J.C. Penney’s stores and online at JCP.com through the end of the day. If you head to the store the cashier will give you a scratchoff card that is good for either 15%, 20% or 30% off, online you can use the code NICE15 to get 15% off. There are a few limited restrictions (not good for Sephora, eyeglasses, etc.) but otherwise you get the percent off all regular, sale and clearance prices. The scratchoff I got in the mail with the ad was good for 30% off so I hit the store and combed the clearance racks for hoodies for the kids for next year. I ended up with nine items including a shirt and hoody for the hubby for only $56.19, the receipt says I saved $196.38. Feeling really good about this purchase, but saddened that they didn’t have anything in the uniform section and that I didn’t get anything for myself, I got online and did some more shopping after I got home. The sales clerk told me I could use the coupon repeatedly during the sale so I was also able to get 30% off my online purchase where I was lucky enough to snag some cheap uniform shirts for the kids and some tights and socks for the girls, I even got a neat charcoal cardigan for myself! Happy shopping! Our local county school system requires that the kids wear uniforms, which actually makes it a little easier to shop for back to school. I bought the cutest brown leather Mary Jane’s a couple sizes too big for the girls on clearance AFTER the back to school shopping season last year, but I found these adorable casual Mary Jane’s on clearance at JC Penney’s and figured they would need a spare pair so I grabbed them while I could and used the coupon code TEN4YOU to get $10 off a $10 or more order. 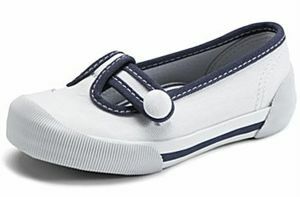 That made the deal sweet enough that I didn’t mind paying for shipping – I ended up with two pairs of school shoes for this fall for $14.97 shipped. Aren’t they cute? 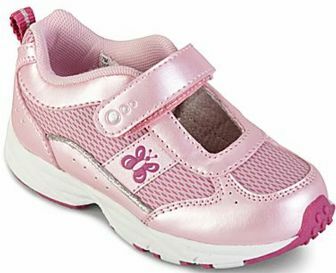 The uniform policy doesn’t allow logos or writing of any sort on the kids’ shoes so these will be perfect! Be sure to sign up for the JC Penney Savings Newsletter so you’ll be informed right away of coupon codes like this one! J.C. Penney has a new $10 off $25 purchase coupon available. The offer is only good in stores and is available through February 27th.